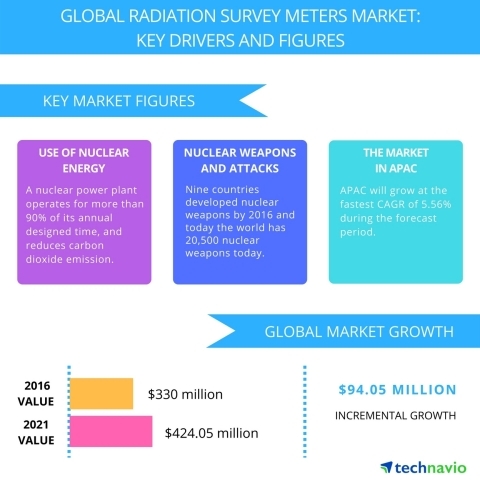 Technavio analysts forecast the global radiation survey meters market to grow at a CAGR of more than 5% during the forecast period, according to their latest report. The research study covers the present scenario and growth prospects of the global radiation survey meters market for 2017-2021. The market is segmented based on application (healthcare, industry and manufacturing, and defense), and products (scintillation detector, neutron detector, and Geiger counter). The market is further segmented into geography (APAC, EMEA, and North America). The revenue of the global radiation survey meters market will reach USD 424.05 million during the forecast period. Although radiation is useful in different industries including healthcare, nuclear power plants, manufacturing industry, and agriculture, it has severe harmful effects on the human body such as the induction of cancer, skin burns, and thyroid. The radiation levels should be regularly monitored and measured using radiation survey meters to mitigate these effects. The treatment of cancer and several other diseases use radiation therapy, thus increasing the use of radiation meters in the healthcare industry. The energy generation process with the use of natural gas or coal generates a high amount carbon dioxide which is a greenhouse gas. With the use of nuclear energy, the amount of carbon dioxide generated can be reduced to a significant level. Due to this, many countries are now shifting to nuclear energy for their electricity needs. The energy demand across the world is increasing. The advantage of a nuclear power plant is that the energy generation is continuous. A nuclear power plant operates for more than 90% of its annual designed time. The continuous supply of energy helps in countering the volatility in the prices of other fuels such as diesel and petrol. Radioactive materials are a big threat to defense personnel at the time of conflicts. Nuclear weapons can cause mass destruction when radioactive material is released in highly populated areas. Radiation survey meters help defense personnel in detecting weapons of mass destruction and help them stop the potential threat of nuclear attacks. A very important factor that is driving the adoption of radiation survey meters in the military and defense sectors is the increasing instances of the terrorist attacks. “Due to the applications of radiation survey meters for the safety of a country, manufacturers are also offering customized survey meters for the defense and military sectors. For instance, the MultiRad LLR Radiation Survey Meter by Mirion Technologies is specially designed for civil defense and military operations. Such customized products for the military can withstand harsh conditions encountered during wars,” says Navin. The use of the radiation survey meters is increasing in manufacturing industries like metal, paper, and textile manufacturing industries. The awareness about health hazards of radiation is increasing among the employees of such industries. This rising awareness is driving the survey meters market. In vehicles, to check the quality of steel, radiation particles are fed to it. The quality is determined by assessing how many particles passed through it. A similar application is there in the aircraft and paper industries. In the petroleum industry, radioactive tracers are used for injection profile and locating fractures in oil wells. The food processing industries use irradiation methods to destroy bacteria, molds, and viruses and prolong the shelf life of food. The dose of radiation in these industries is detected, measured, and monitored by professional personnel, and radiation survey meters are required to ensure their safety. These applications of radiation survey meters will boost the market’s growth during the forecast period. Become a Technavio Insights member and access all three of these reports for a fraction of their original cost. As a Technavio Insights member, you will have immediate access to new reports as they’re published in addition to all 6,000+ existing reports covering segments like embedded systems, semiconductor equipment, and displays. This subscription nets you thousands in savings, while staying connected to Technavio’s constant transforming research library, helping you make informed business decisions more efficiently.